It felt more emotional than I’d expected… personal, even. Nelson Mandela is dead. A great, great man has passed out of this world. And I am reminded again of all the history South Africa and the United States share regarding both racial injustice and the heroes such injustice forged. Mr. Mandela was South Africa’s George Washington, Martin Luther King, and Barack Obama combined. He was a man of peace yet used violence at times to break his people’s chains. And like World War II martyr Dietrich Bonhoeffer, he was imprisoned and while in prison made some of his most potent contributions to others’ freedom. Literally as he walked from his Robbins Island prison cell through the front gate, he determined to choose forgiveness… and helped forge one nation out of former enemies. I thank the Lord God for Nelson Mandela and the part he played in freeing four-fifths of a nation from the tyrannical one fifth… yet embracing that disempowered one fifth after freedom had been won so that they too could share in it. Part of that astonishing process was South Africa’s Truth and Reconciliation Commission, established by Nelson Mandela as one of his first acts as President and chaired by Archbishop Desmond Tutu. In return for the full confessions of the Apartheid regime’s prison guards, torturers, policeman, and soldiers before the relatives of those they had maimed and murdered, they were allowed to go free — forgiven of their crimes. It was in the view of both Mandela and Tutu the only way forward through the intense bitterness sown by Apartheid. But all these things happened half a world away from me, from us of Jesus People USA. Why then does Nelson Mandela’s death strike me so deeply? Strike us, so many of the older members of Jesus People USA in particular, so deeply? It isn’t easy to explain. Maybe part of the reason was Dawn Herrin (now Mortimer) and her family, which she raised in the Southern United States during the heat of the Civil Rights movement. Her heart, and her childrens’ hearts, were profoundly affected by the overt racism they encountered. When Dawn moved North with the Jesus People, her family brought that experience with them. Then, in 1978, right as we were researching and publishing articles on apartheid in our Cornerstone magazine, we merged with a smaller mostly African American community from Chicago’s South Side. Community itself became and remains an ongoing lesson in racial reconciliation. We wrote about apartheid for another burning reason: It purported to be a Christian doctrine, established upon biblical principles. This haunted us, horrified us, caused us to become overtly militant in our responses. The doctrine was demonic, and we meant “demonic” in a literal sense. Inspired by and indwelt with Evil. It struck at the root of both the God-Image in man and the relational root of human community; a mutual respect rooted in self-forgetful love. We would not, we determmined, be silent. It was not the last time REZ would address apartheid, as their song “Zuid Afrikaans” was lyrically even more intense. We protested en masse Rev. Jerry Falwell’s nationally televised comments about Nelson Mandela and Desmond Tutu “aiding communists” by marching in Chicago’s Daley Square to deliver — as Evangelical Christians — an anti-apartheid written statement to the South African embassy. (Falwell’s embrace of white South Africa’s government was another reason we couldn’t agree with the “Moral Majority” or its descendants.) We handed out copies of our statement to hundreds of passers-by. It was, compared to Nelson Mandela’s sufferings and struggle, almost nothing. But “almost” is still something… and it was the something we could do. Our mustard seed? I remember the growing world protest that pushed even Ronald Reagan aside as it increased pressure on the Apartheid Government of SA to cave. I remember two of our writers, Ida Dawn Mortimer and Katherine Williams, going to South Africa and being cared for wonderfully by people too poor to do so without personal sacrifice. I remember the photos of Soweto, the massive ghetto city outside Johannesburg, that was built because of apartheid. And I remember seeing theology used as the core of apartheid, a theology which claimed roots in the Bible but in reality was rooted in an idolatrous evil of Race. Nelson Mandela struck a blow against apartheid in the early 60s that led for him to prison… but for his nation led to freedom. 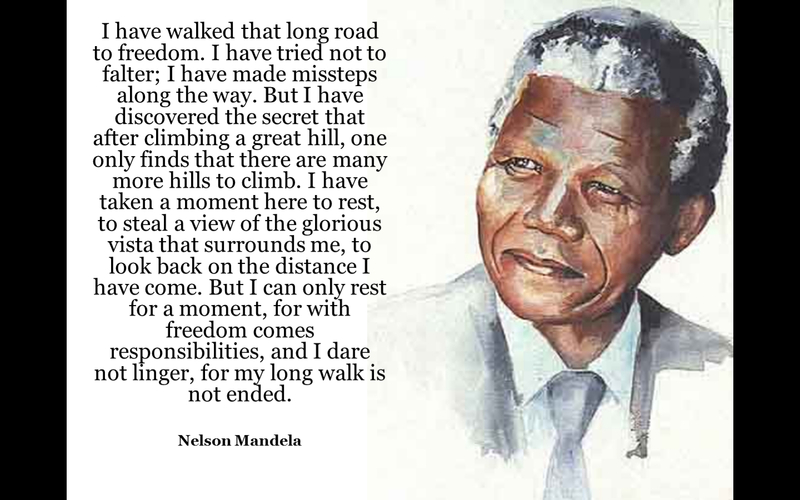 God bless you, President Mandela, Prophet Mandela, “Father.” God bless you and keep you now forever.